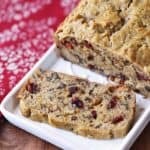 An easy recipe for a gluten free, keto and low carb fruitcake, that tastes wonderfully nutty and rich without being cloyingly sweet. I’m not sure why fruitcakes are so controversial. Admittedly some of them are very bad! Dense, heavy, filled with fake red-and- green-hued dried fruit. But when made right, such as this low carb keto fruitcake, I think they are absolutely delightful. A good fruitcake, whether low carb or not, should not be dense, heavy or sickeningly sweet. It should definitely not be filled with fake-dyed “fruit.” A good fruitcake should be moist, yet light and fluffy. It should be gently flavored with vanilla and orange. And it should be dotted (but not overwhelmed by) real, non-dyed dried fruit and toasted nuts. My own version of a gluten free, low carb fruit cake, is moist-yet-fluffy and very flavorful. The nuts get toasted as the cake bakes, and the dried cranberries melt into the sweet (but not overly so) batter. 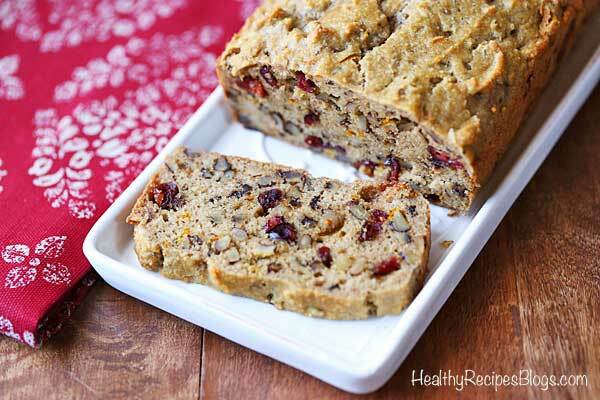 I use dried fruit sparingly, to keep this cake as low carb as possible. And I prefer to use solely cranberries, because they are so pretty, and because I like to keep my recipes simple. But obviously, you can replace the 1/2 cup of cranberries with any dried fruit you like. Scroll down to the recipe card for the detailed instructions. How do you flavor fruitcake? I use vanilla and orange zest to flavor this fruitcake. My low carb fruitcake does not contain cinnamon, because I don’t want it to overwhelm and mask the other flavors. And it does not contain alcohol, simply as a personal preference. But you can use brandy instead of the vanilla extract if you wish. Is this low carb fruitcake appropriate on the keto diet? It can be, as long as it’s not a daily habit. Despite being much lower in carbs than traditional fruitcakes, this low carb fruitcake is not ideal if you need to eat super low carb. For example, less than 50 grams per day. You get a thin slice for 5 grams net carbs. This is not too bad, but my low carb gingerbread cake is probably a better choice. You get a generous slice for 3 grams net carbs. Speaking of thin slices, this is a very rich cake, so definitely cut it into thin slices. I cut mine into 14 slices. Leftover of this keto and low carb fruitcake keeps well in an airtight container in the fridge for several days. I warm them slightly in the microwave before enjoying, just a few seconds per slice. An easy recipe for a very tasty gluten free and low carb fruitcake, that tastes wonderfully nutty and rich without being cloyingly sweet. Preheat oven to 350 degrees F. Line a small loaf pan (8 X 4 inches) with two overlapping strips of parchment, allowing the strips to overhang on each end, creating handles (as shown in the video). Spray the parchment paper with oil. In a medium bowl, whisk together the eggs, butter, vanilla, stevia, orange zest and kosher salt. Add the almond flour, whisking it until very smooth. Whisk in the baking soda. Add the cranberries and walnuts, folding them in with a rubber spatula. Pour the mixture into the prepared loaf pan. Smooth the top with a spatula. Bake until a toothpick inserted in center comes out clean, about 30 minutes. The cake won't get very dark. Cool in pan on a cooling rack for 20 minutes, then use the parchment “handles” to lift the cake out of the pan. Place the cake on the cooling rack, allow to cool 10 more minutes, then slice into 14 thin slices and serve.